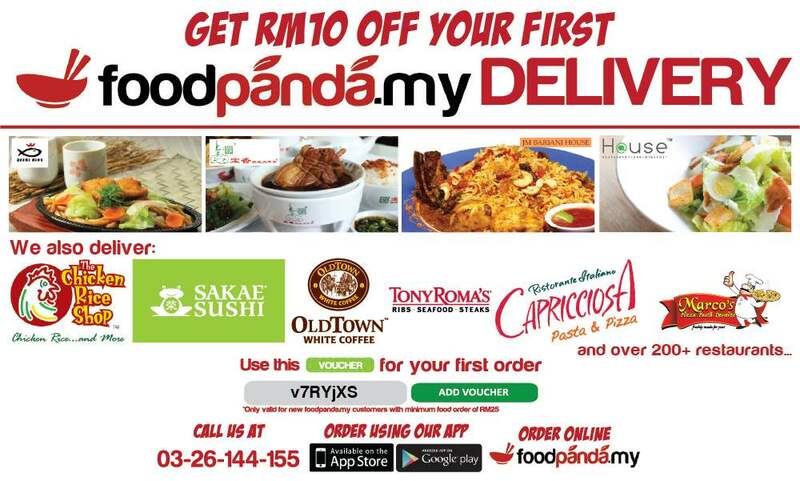 Get RM10 Discount for your favourite food (Sakae Sushi, Tony Roma's etc) Delivered to Your Doorstep! Food delivery from over 200+ restaurants in Klang Valley and Penang. Search City and Area that you want food to be delivered to. Select the Restaurant that you want to order from. Click Order Now - your food is on the way to your delivery location. For new foodpanda.my customers only. This voucher code is valid from 1st May to 31st May 2013 only. Valid for delivery or pre-order delivery within delivery area. Not valid for pickup orders. Valid with a minimum food order of RM25. One voucher per customer per order. Vouchers cannot be combined. LIKE & SHARE out to your hungry friends ya! foodpanda believes ordering food online should be fuss-free, fast and definitely fun. Forget about the pain of cooking and cleaning up! Enjoy a variety of cuisines (Japanese, Asian, Western etc) at your home or office. With just a few simple clicks, foodpanda helps you to easily order food from your favourite restaurants (200+) over the internet. Steaming hot food is conveniently delivered to your home or office. Currently, foodpanda only delivers food to Kuala Lumpur, Petaling Jaya, Shah Alam-Klang, Subang Jaya-Puchong, Cyberjaya-Putrajaya AND Penang! More locations coming soon!